Rinse the strawberries then dry gently. With a small knife, slice the top off of each berry and also a small piece of the bottom of the berry (so the berry will stand up). Using the tip of the knife, hollow out enough of the berry to add the filling. Keep all of the bits of strawberry that you have trimmed and chop them up finely. In a small bowl, stir together the cream cheese, powdered sugar and the reserved bits of strawberry. 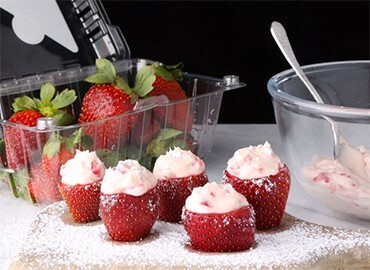 Use a small spoon to fill the strawberries with the cream cheese mixture. Sprinkle with additional powdered sugar just before serving.